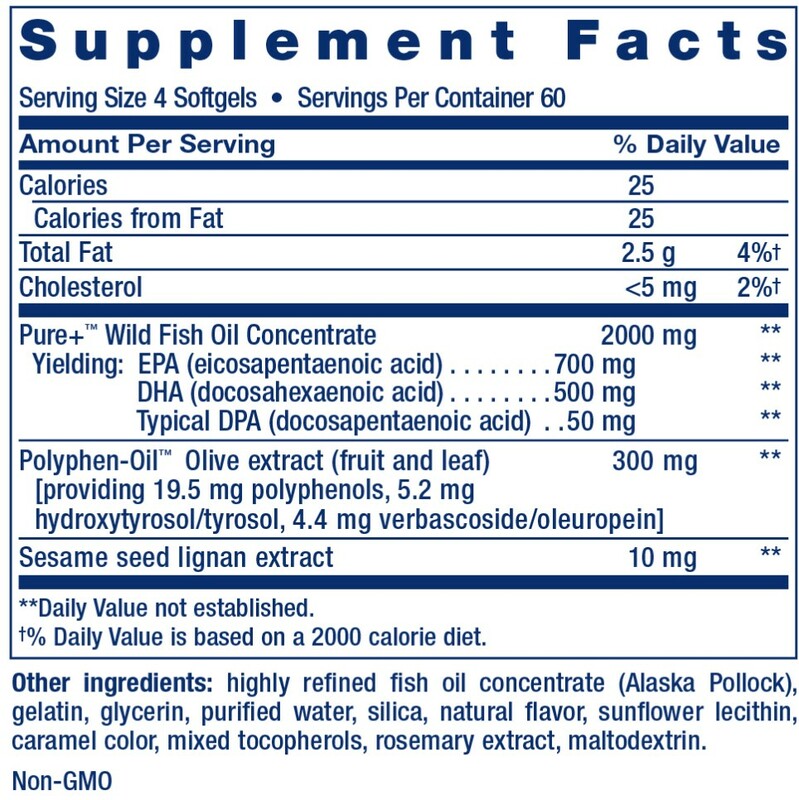 Super Omega-3 EPA/DHA with Sesame Lignans & Olive Extract features a pure, fresh fish oil made from sustainably harvested Alaska Pollock and that has earned the International Fish Oil Standards’ (IFOS™) highest 5-star rating. Inspired by the heart-healthy Mediterranean diet, this superior formula also contains olive extract, sesame lignans, and natural lemon flavor, making it the most comprehensive omega-3 supplement for heart and cognitive health support on the market. The omega-3 fatty acids found in fish oil are essential elements of a healthy diet. But the typical Western diet, which contains high amounts of omega-6 fats, is usually insufficient in beneficial omega-3s like eicosapentaenoic acid (EPA) and docosahexaenoic acid (DHA).1 Therefore, supplementing with healthy omega-3s is a great way to support heart health and more. There are many fish oil supplements out there … but very few utilize a sustainably harvested fish oil made from cold-water Alaska Pollock that is both caught andprocessed in the United States within hours of harvest for exceptional freshness. The fish oil in our Super Omega-3 formula has earned the International Fish Oil Standards’ (IFOS™) highest 5-star rating, and comes from a Marine Stewardship Council (MSC) certified-sustainable fishery. Which means it actually exceeds industry standards. Do you know where your fish oil comes from? MuscleTech Omega 4X SX 7 Black Onyx - short dated sale! !